A list with years, containing months and month days. A list with month names. A list with year numbers. 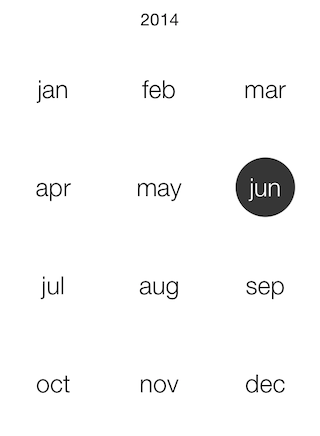 A flow layout with months and month days. 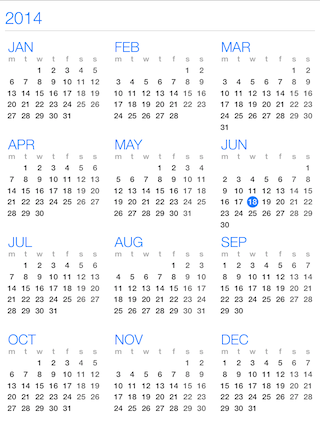 A separate view controller to allow iOS 7 calendar style like experience. This article describes those view modes in detail. 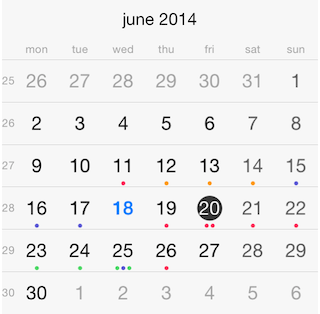 Dates in this view mode are represented by the TKCalendarCell class which inherits from UIView. The visual appearance can be customized by creating custom cells and handling the calendar:viewForCellOfKind: method of TKCalendarDelegate protocol. This technique is described in Calendar customizations article. This view mode is similar to the previous one, but it displays only one week. The presenter class for this view mode is TKCalendarWeekPresenter, it inherits from TKCalendarMonthPresenter and allows the same customization and behavior features. This view mode displays a list of years with their months and dates. The user can select months by tapping on them. The presenter class for this view mode is TKCalendarYearPresenter. Set the viewMode property to TKCalendarViewModeMonthNames to enable this view. The month names view is used together with the month view mode when the allowPinchZoom option is turned on. It allows for selecting a different month faster. Use pinch-in/out gesture to switch between single month/year numbers view mode. The presenter class for this view mode is TKCalendarMonthNamesPresenter, it inherits from TKCalendarMonthPresenter and allows the same customization and behavior features. Set the viewMode property to TKCalendarViewModeYearNumbers to enable this view. The year numbers view is used together with the month view mode when the allowPinchZoom option is turned on. 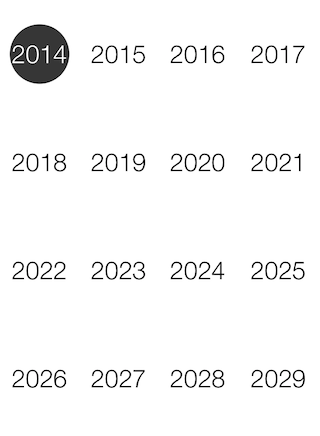 It allows for selecting a different year faster. The presenter class for this view mode is TKCalendarYearNumbersPresenter, it inherits from TKCalendarMonthPresenter and allows the same customization and behavior features. Set the viewMode property to TKCalendarViewModeFlow to enable this view. 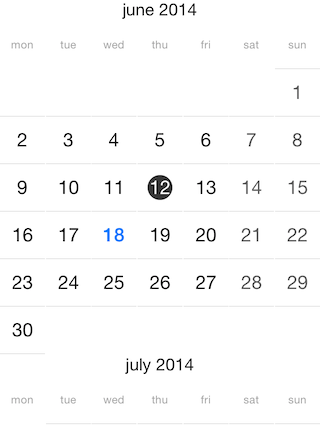 The flow view displays months with single dates. Single cells are represented by the TKCalendarCell class and allow customization by handling the calendar:viewForCellOfKind method. Only the single selection mode is available when selecting cells in flow view. The presenter class for this view mode is TKCalendarFlowPresenter. The contentView property of TKCalendarYearViewController contains the presented TKCalendar object instance. Use its properties and methods to customize the calendar.